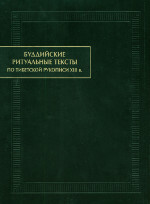 This book presents the unique Tibetan manuscript kept at the Insititute of Oriental Manuscripts, the Russian Academy of Sciences. The scroll Дх. Тиб. 178 that belongs to the stage of the formation of the Tibetan Buddhist Canon and can be dated presumably to the 13th century contains a collection of Tibetan Buddhist ritual texts - hymns, prayers, sadhanas, pujas, relating to the cults of several Budhist deities, namely Mahakala, represented in two of his forms such as the Raven Faced One and Four Armed One, Vishnu Narasingha and the Mandala of Vajrapani and the great Naga Kings. It is quite probable that some texts of the scroll cannot be found now anywhere else, the texts on the cult of Vishnu Narasingha being of special interest in this respect. The introduction contains a detailed description of the scroll and analysis of its contents. The transliteration of the text and its facsimile are supplied with the full Russian translation and English translation of selected texts and fragments. On December 18, 2018, the Second Academic Conference 'Source Studies and Historiography of the Countries of the Near and Middle East' in memory of V.F. Minorsky (1877-1966) will be held at the IOM RAS.